At the conclusion of the seven day mourning period in Judaism known as shivah, it is customary for the mourners to take a cathartic walk around the neighborhood as a symbolic return to the community. Many mourners have commented to me that this walk is a therapeutic way to clear their head and move from a state of mourning into the next phase of beginning to adjust to life without their loved one. A week ago my family celebrated the milestone of my oldest child becoming a bar mitzvah. For our family, this was truly an event we anticipated for many years, if not from the moment he was born. 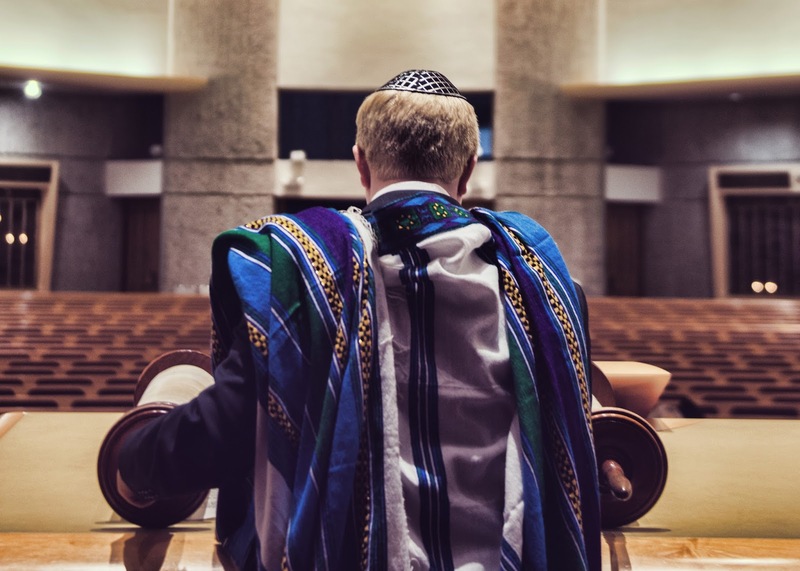 Our son spent a year preparing himself to be able to chant beautifully from the Torah and Haftorah, lead the Shabbat morning services, and deliver a thoughtful and inspiring d'var Torah about the importance of being persistent as a leader. He was amazing and made us extremely proud of his accomplishments. For the entire week following his bar mitzvah, we were still reveling in the celebration. Yesterday, as Shabbat was in its final hours I asked if anyone in my home wanted to join me for a walk outdoors. The next thing I knew, my wife and I were joined by our three children for a brisk walk around the neighborhood for about an hour. It was the perfect way to reflect as a family on the past Shabbat, what joy we all felt as we celebrated this milestone with family and close friends, and a symbolic way to now come down from the clouds and return to reality. I pray that we should all experience such moments of extreme pride in our children's accomplishments and joyous celebrations for the future vitality of the Jewish people. Together with my beautiful bride who stood with me under a chuppah on this very bimah almost eighteen years ago, I say zeh hayom asah Adonai, nagilah v'nishmecha bo. We are so grateful to God who has created this day and we will surely celebrate it with joy. I must tell you that my intent was to just be a Dad this morning. After all, "Dad" is my favorite job! But when Rabbi Bergman asked if I'd like to deliver the sermon this morning, I was honored and decided that I would attempt to share some insights from our Torah portion that might convey just a fraction of the message I want to impart to my son. But make no mistake -- this is not me talking directly to my son. Rather, I hope you too will take to heart the three themes I share this morning. Three themes I believe convey a few lessons to us as parents. But first a joke: A Jewish mother is with her son at the beach, a son of whom she is of course very proud as he recently passed his medical exams. Within minutes of entering the water for a swim he gets pulled under by a big wave and it's obvious he doesn't know how to swim. Urgently, trying to get someone to come to her son's assistance, she screams, "HELP! HELP! My son the doctor is drowning!" It's a cute joke, and of course it fits well in the vast category of humor that is jokes about Jewish parents' high expectations for their children. But when we take a closer look at this joke, looking deeper than the wittiness that is on the top layer, we can consider what we really should want of our children. Yes, having a son who becomes a doctor is a nice thing and my parents' batting average of .500 is commendable in that regard. However, swimming was a more important skill and one that would have saved this man from drowning. As parents, we often think about what type of adult we want our children to become. Which attributes should we favor? Are we content for our children to become good people or is it more important that they're successful? Many argue that so long as our children are happy, we are satisfied. I'm going to argue that happiness, success and goodness are all vital attributes we want and expect of our children, but that in this week's Torah portion, Parashat Bo, we can find three categories that we as parents, should be prioritizing as we nurture our children and watch as nature takes its course: These three attributes are Leadership, Questioning and Continuity. In our parsha this morning we continue to see Moses growing as a leader. We know that he is an unlikely leader and his path to leadership was an unusual one -- he didn't choose the leadership role nor did he desire it. As my son accurately noted earlier in his d'var Torah, Moses was a successful leader because of his persistence in his dealings with Pharaoh. In addition to persistence, we can see two other important attributes of Moses's leadership after he challenges Pharaoh and the Israelites begin their wandering in the desert. The first is how Moses patiently listens to the advice of his father-in-law Yitro who provides helpful leadership coaching. The second was in the transfer of leadership to my favorite Biblical character and the namesake of my firstborn, Joshua. I've always been fascinated by the smooth way the leadership of the Israelites was passed from Moses to Joshua. A strong leader is able to get the job done and then help prepare his successor. As parents we model leadership to the next generation, eventually handing off the leadership of our own tribe -- our family -- to them. Will they be ready? Will they be able to lead? These are the big questions. If we impart sound leadership examples to them, we can be confident in their future leadership. The second attribute we should want our children to possess is questioning. Why do Jews always answer a question with another question? WHY NOT?! What is unique about Jewish education? As it says in our Torah portion this week: “And it shall be when your child asks you in time to come, saying: What is this? You shall say unto him." In other words, when our kids ask us about our history, we should tell them the story. Our story. Our history. This is the core ritual of the Passover Seder. Perhaps the single most important lesson we as parents are commanded to teach our children. And we aren't commanded to just do it once, like teaching our kids to swim, rather we repeat this teaching year after year. In our parsha, we are presented with the first set of mitzvot in the Torah - the commandments of Passover. We are told to eat matzah, rid our homes of chametz, to celebrate our liberation from slavery, and to relate the story to our children. These are all important commandments, but the most important is the prompt. The child on Passover is taught the importance of questioning. Are we there yet? Why do I have to eat my vegetables? Can we get a dog? Our children are naturals at asking questions! We must nurture this beautiful act of questioning and encourage it. They will benefit from it and so too will we. In my own Bar Mitzvah Torah portion that I chanted right over there 27 years ago, it says: "She'al avicha v'yagedcha" - ask your father and he will teach you. We are a people that questions and we want our children to continue questioning as part of their development. The third attribute we want our children to possess is continuity. Asking questions at the Passover Seder is just one way of ensuring the continuity of our people. We also want them to continue the other traditions of our people, to continue to value the democracy we enjoy as Americans, to preserve the customs we hold dear in our own families. In our parsha, we learn of the unique commandment of redeeming our first born son, the mitzvah called Pidyon Haben. Today, with the prevalence of c-sections and the fact that only baby boys who are the first issuance of the mother's womb require the Pidyon Haben ceremony, it has become even more unique than in past generations. After my dear teacher Rabbi Neil Gillman redeemed our son on his 30th day on this Earth at the Jewish Theological Seminary, he penned a newspaper article about how special this ceremony is and how rare it is for him to be asked to facilitate it. It's meaningful that the commandment for Pidyon Haben is found in this week's parsha because it gives us the opportunity to tell our son why we chose to have this ceremony for him. It was not merely because we felt a sense of commandedness, but because it was important for us to ensure the continuity of this rite. It is part of the dialogue that we must ensure continues for generations to come. As Tevye sang in Fiddler on the Roof: "Tradition!" Yes, we all want our children to be good, successful and happy. How do we help them achieve these qualities? With leadership training, the encouragement to ask questions, and through reinforcing the vital need to ensure continuity. As my own child acknowledges his coming of age -- his reaching the age of responsibility, I am encouraged and proud of the way he leads and how he is growing into more serious leadership roles. I love how he questions everything and I pray he will continue to be a questioning individual and never content with the status quo. And I am relieved that as my family and I have witnessed this morning, he is a rightful heir of the chain of tradition, continuing on the Jewish path that was set by our ancestors and leaving a trail for future generations. Leadership, questioning and continuity. Ken yehi ratzon... and so may it be. Shabbat Shalom!